Some parking spots at the Edmonton airport have become Internet famous, thanks to some creative grass-roots Lexus marketing. It’s a good time to be a frequent-flying Lexus owner in Edmonton—at least, if you’re looking for a good parking spot at the airport. A bit of grass-roots Lexus marketing has been stirring the pot at Edmonton International Airport, where 30 stalls have been branded with the iconic Lexus logo, and “reserved” for Lexus owners. It’s part of an offered executive parking program provided by Pattison Outdoor Advertising, which has been used by brands before, but never outwardly branded. 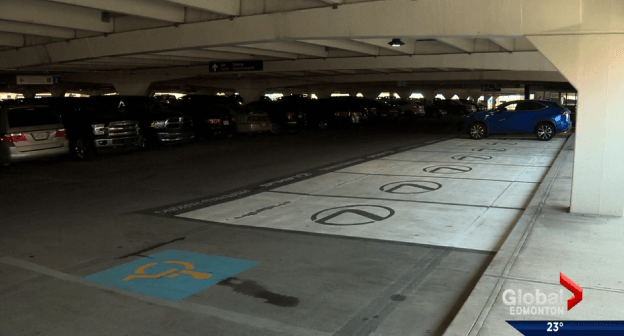 The parking spots, which represent 0.23 per cent of all the 1,300 available spots at the airport (as pointed out by one observational Twitter user) and don’t remove any handicap parking, cover a portion of one side of the 3rd floor of one of the parkades. As with most things at airports, the move has some people up in arms, and others who think it’s brilliant. The brand points out that no vehicles, regardless of brand, will be penalized for parking in the spots. “They may have an urge when they get back to buy a Lexus, hopefully, but otherwise they’re happy to park there,” a Lexus employee said in an interview with CTV News. Either way, it’s got people talking. And doesn’t that Lexus look good parked in the Lexus preferred parking spot? Photo by Lexus of Edmonton.